Data, Data, Data! I’m drowning in data," say most marketers. "How can I make sense of it all?" CLI OneSource answers that question with clarity, conciseness, and helpfulness. Marketers want answers, and CLI OneSource delivers. Marketers want clarity, and CLI OneSource delivers. Marketers want help, and CLI delivers! CLI believes in helping clients navigate the data swamp, and we listened to our clients as they told us what they need. "First," they said, "we need to tame this wild data," and CLI responded with several ways to meet that need with tools such as Matchback, MatchXL, Match360, Hindsight, HealthCheck, and others. Then they said, "Second, we need reporting that we can actually use." CLI understood that presentation of data in usable ways needed work, and CLI OneSource became the result and the central repository for reports that make sense and that provide concise, actionable data for our clients. 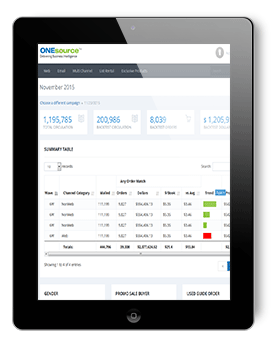 CLI OneSource delivers clear, concise, actionable data presented in ways that clients can use to tame the wild data and to make sound business decisions. CLI OneSource - The destination for the information you need.